1. 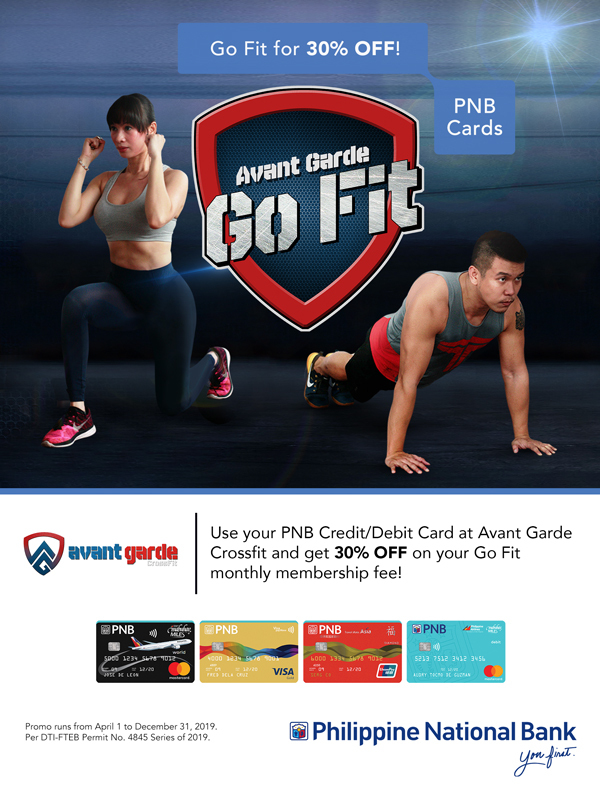 The promo is open to all active Principal and Supplementary PNB Credit/Debit cardholders. 2. Promo runs from April 1 – December 31, 2019. 5. To avail of the promo, the Cardholder must charge the total amount of the bill to his PNB card. Cardholder must inform merchant he/she will avail of the PNB Cards promo. Standard service charge shall apply. 6. Promo is valid for first-time members only. Membership is non-refundable. Additional charges will be made for freezing membership. 7. Offer is not convertible to cash and cannot be exchanged for other items or discounts. The offer cannot be used in conjunction with other promotional offers by the partner merchant. 8. In the purchase of goods and services which are on promotional discount, The Senior Citizen can avail of the promotional discount or the discount provided under the Expanded Senior Citizens Act of 2010, whichever is higher. 9. The Terms and Conditions governing issuance and use of PNB Cards are incorporated herein by reference and made an integral part hereof. Per DTI-FTEB Permit No. 4845 Series of 2019.